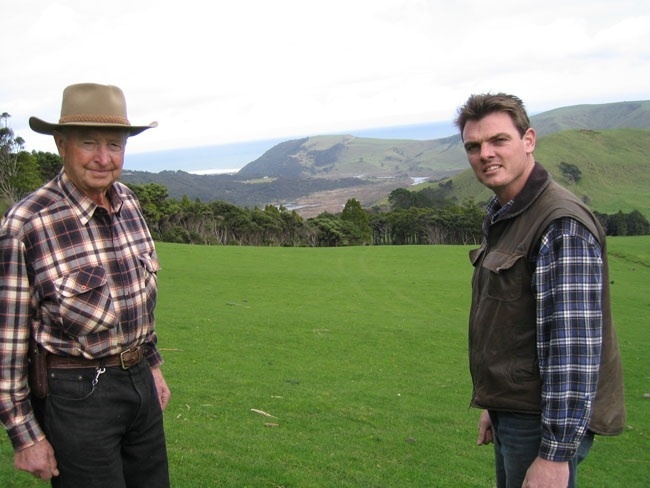 Fifth generation Jonkers on the farm, Greg with his Grandfather & teacher, Artie Jonkers. Jonkers Farm is a working farm, situated in Auckland, New Zealand. With 540 acres of beautiful wilderness, they specialise in local and international film production, events and pop up weddings. They have all necessary vehicles and logistical equipment to make each job a complete success while working on a remote location. 15 Minutes from West Auckland Film Studios. 540 Acres of Farmland with Native Bush, vintage farm buildings, vistas, natural water features and tracks. Panoramic views of both east and west coast. Top dressing airstrip, fully operational. Good access to 3 large all weather car parks. On-site 4WD Generator trucks, Hiab, Flat Decks and people movers for film crews. Greg Jonkers, along with his wife, Joanna bought the farm off Greg’s Grandfather, Artie Jonkers in 2001. The farm has now been in the Jonkers family for nearly 100 years. It was first purchased by Greg’s great Grandfather, Rupert Jonkers in 1924. Greg along with his family of five continue to work the farm with traditional farming methods. The farm has Black Angus Cows, Romney Sheep, Working Dogs, Wild Goats and Wild Turkeys and beautiful native birds. Panoramic view of east and west coast of Greater Auckland. The Auckland Sky Tower and Auckland City. Grass fields, native bush and rugged steep terrain. Streams, ponds, waterfalls and rocky areas. 1940′s Woolshed, Hay sheds, vintage farm buildings and 1926 Homestead. Dirt roads, tracks through bush and beautiful picturesque landscape. Fully formed all weather road to remote locations with base camp.